Infrastrata’s recently announced exploratory well in Co. Antrim—to be or not be? A company called Infrastrata have recently obtained ‘permitted development’ rights to drill an exploratory borehole, in their Larne-Lough Neagh Basin licence area—starting and finishing within a four-month time period sometime between September 2014 and March 2015—but will the project ever get off the ground? approval from the Northern Ireland Environment Agency (NIEA), the Northern Ireland Health and Safety Executive (HSE), and the Department of Enterprise, Trade and Investment (DETI). A partner company, Nautical, pulled out of the joint venture when it was bought over by Cairn Energy plc, and so Infrastrata now need a new investor/partner to help finance the project. Their subsidiary company, Islandmagee Storage Ltd has recently been dealt a blow by BP Gas Marketing Ltd pulling out of the planned gas storage project at Islandmagee. These withdrawals of continued support cannot be helpful to the company’s plans. As news of the planning permission being granted under ‘permitted development’ rights has emerged, residents and environmental groups are appalled that such a project can be given this type of planning permission which bypasses public information provision, consultation, and independent environmental scrutiny. People who live nearby have not been given an opportunity to voice their concerns about the potential health impacts of exploratory drilling. In Northern Ireland, Part 16 of Schedule 1 of the Planning (General Development) Order (Northern Ireland) 1993, allows ‘permitted development rights’ to apply to the drilling of exploratory boreholes for ‘Mineral Exploration’. This means that the normal planning approval processes do not apply, as long as certain limited conditions are met. 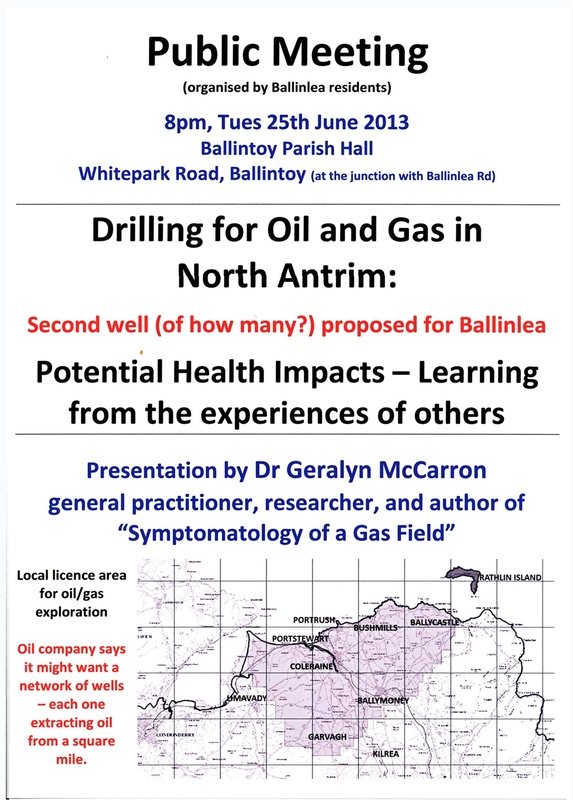 Questions must be asked, about whether it is still appropriate for Northern Ireland to include the drilling of exploratory boreholes for petroleum explorations as ‘permitted development’. England and Scotland have specifically excluded it from their equivalent legislation. The Department of the Environment (Northern Ireland) states that: “Generally, permitted development rights are applied to relatively minor non-contentious development”. However, drilling exploratory boreholes for petroleum exploration cannot be described as either minor or non-contentious. The nature of onshore oil and gas explorations has changed markedly in the decades since this legislation was prepared. The technology and techniques used by the industry have become much more complex as the target rocks have become more difficult to access. Public knowledge of the potential health impacts of the fugitive emissions of toxic gases to the air as a result of drilling and/or flaring, potential water and ground pollution from loss of drilling fluid and toxic waste, have increased due to more public health research being undertaken and information being more readily available. The lack of public information, consultation or opportunity for participation in decision-making around such a project, which could have significant environmental and health consequences for the local community, and is likely to involve 24hr drilling with associated lighting and noise, surely contravenes at least two of the three pillars of the international Aarhus Convention—access to information, public participation and access to justice—to which the UK, including Northern Ireland, is a signatory. It remains to be seen whether Infrastrata’s exploratory borehole will proceed…it obviously still depends on everything falling into place by September/October. The company, the DOE, NIEA, HSE and DETI can expect to hear some objections between now and then—particularly as the company is likely to want to explore for multiple types of oil deposits, including those in tight sandstones or source rock, requiring unconventional extraction methods such as the controversial high volume (slick-water) horizontal hydraulic fracturing. 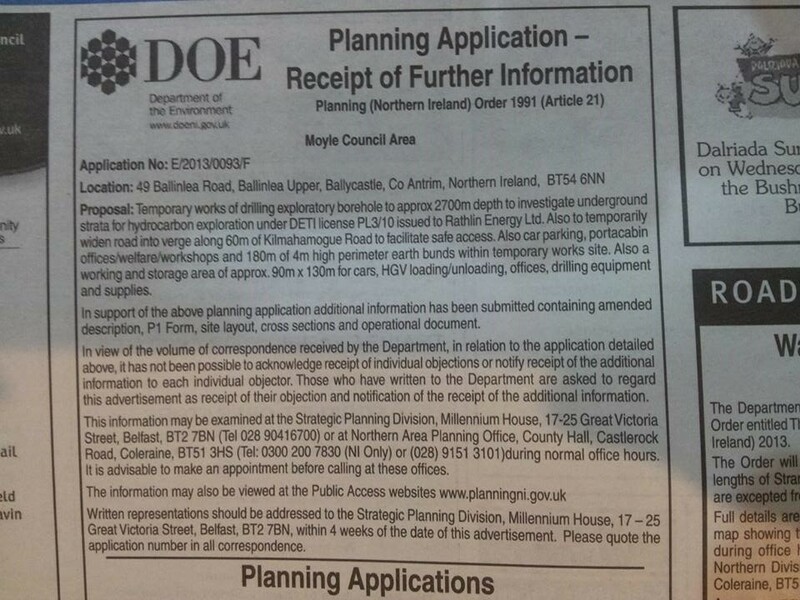 Believe it or not, Rathlin Energy’s planning application for an exploratory well at Ballinlea is still live. Rathlin Energy Ltd, through their agent, Belfast-based RPS Group Planning Consultants, have still not provided sufficient, adequate, information to the planners, for them to be able to make a determination on whether an Environmental Impact Assessment (EIA) will be necessary for decision-making in this planning application. The planners wrote to the company in November requesting significant additional information: Letter from DOE to RPS – 7 Nov 2013. They have since issued two extensions to the initial timeframe, with the latest deadline being 13th March 2014: Letter from Planning to RPS 15 Jan 2014. More information is to come. Any new objections or concerns you may have about the information provided in these documents will be considered in the planning decision process, so please have a look and see whether there are specific objections you’d like to raise with the planning authority. Do you think this scale of project warrants an EIA? The legislation is here. Once the Planners have all of the requested information from RPS/Rathlin Energy, they will have four weeks in which to determine whether an EIA is required. The public should also have some weeks to consider the new information provided by the company, and an opportunity to comment on that information, in March/April. Local residents at Ballinlea, Co. Antrim are encouraged by the hundreds of letters and emails being sent to the Strategic Planning Division of the DOE, objecting to the planning application submitted by Rathlin Energy Ltd to drill an exploratory well. Despite being the traditional holiday period, many people took the time to become aware of the risks associated with the proposed well and made their views known. You can continue to lodge your objections right up until a determination is made on the planning application. At this stage, consider 9th August a deadline until we know more. Notice of the Rathlin Energy planning application (E/2013/0093/F) to drill an exploratory oil/gas well was made in the Ballycastle Chronicle dated 11th July. It gave 14 days for submission of written comments. However, the company has been asked to provide more information by 9th August, and objection letters can be submitted until a determination is made, so please continue to lodge your objections. We will update this post as more information becomes available. Please read https://notofracking.com/2013/07/01/rathlin-energy-planning-application-what-next/ and the objection letters below, to find out what is proposed and why residents are not happy about it. An information leaflet and poster have also been prepared by the Ballinlea Residents Association. Please feel free to share them. More sample letters will be added which will include more detailed objections. You can send more than one version to the DOE – they understand that people may make a number of additional objections as new information comes to light. Please feel free to adapt your letter/email to include your own points of objection.